Have you ever seen purple and orange looks so chic? I can definitely say I do not like that color combo, but it works here. 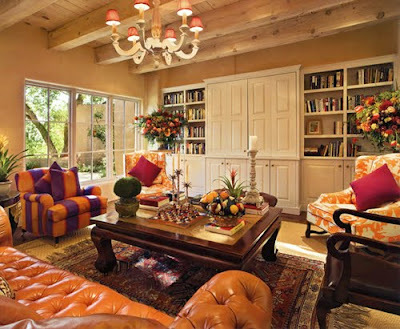 It's a pretty traditional space but the colors keep it comfortable. If I was a Clemson fan, I would totally dig this as my football-game-watching room. Back tomorrow with a full post! Purple and orange (like purple and gold) can definitely run a major risk of looking tacky, but you're right, it works here....but yes, my vote is on the orange toile chairs as well!